Dennis H. Schupp, 84, of Brainerd, formerly of Glencoe, died Saturday, Nov. 19, 2016, at St. Joseph Medical Center in Brainerd. Casket bearers were Stuart Bonniwell, Terry Jopp, Ronnie Trick, Bob Miley, Mike Dittmar and Richard Stoeckmann. Interment was in the First Evangelical Lutheran Cemetery in Glencoe. Dennis H. Schupp was born Jan. 28, 1932, in Hamburg, the son of Herbert and Cordelia (Stoeckmann) Schrupp. He was baptized as an infant on Feb. 7, 1932, by the Rev. E. Kolbe, and was confirmed in his faith as a youth, by the Rev. Alf. Streufert, both at First Evangelical Lutheran Church in Glencoe. He received his education in Glencoe, graduating with the Glencoe High School class of 1950. 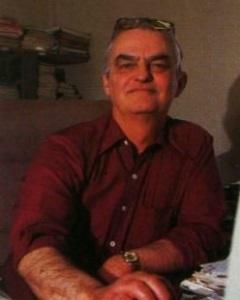 He then attended the University of Minnesota in Minneapolis, graduating in 1955, with a degree in biology. He was drafted into the Navy, where he served on an aircraft carrier in the Asian Pacific. He made his home in Glenwood, Baudette and Brainerd before finding his cabin near Pequot Lakes, which he called home for 50 years. Mr. Schupp worked for the Department of Natural Resources (DNR) researching fisheries. He was known as “Mr. Walleye” because of the specific research he did to save Minnesota’s walleye population. He was a respected researcher and scientist, receiving the DNR’s John B. Moyle Meritorious Service Award and also the Excellence in Fisheries Science Award. He was an associate editor for the North American Journal of Fisheries Management. Mr. Schupp enjoyed fishing, hunting, Golden Labs, reading, playing cards, telling stories and listening to music. He also enjoyed sports, especially University of Minnesota Gophers basketball and football teams and the Minnesota Twins. He is survived by his brother-in-law, Ben Hafner of Glencoe; niece, Susan (Erik) Meints of St. Paul; grandnieces, Claire Meints and Courtney Meints of St. Paul; and many relatives and friends. He was preceded in death by his parents, Herbert and Cordelia Schupp; and sister, Carol Hafner. Arrangements were with the Johnson-McBride Funeral Chapel in Glencoe. Online obituaries and guest book are available at www.hantge.